Physics Buzz: Large Hackable Collider? "We are 2600 - don't mess with us". This quaint little message was recently left by hackers on the Compact Muon Solenoid Experiment (CMS) website at CERN. CMS is one of four large dectectors that analyze data from the Large Hadron Collider (LHC). 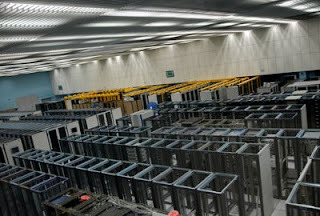 CERN's computer security team has pointed out with alacrity that the hack was minor and relatively harmless. CERN spokesman James Gillies even stated that it appeared the hacker(s) were "making the point that CMS was hackable". I'd wager this is the case- why else would you hack into the most complex physics experiment ever built? Besides, its not likely hackers would be able to understand any CMS data anyway. Seriously, try explaining this. Regardless of the level of intended sabotage, CERN says the LHC accelerator was never at risk. The hacked computer was used only to monitor CMS and wasn't connected to any major control systems. The LHC is designed to churn out half a gigabyte of data every second, tantamount to filling a standard 100 gigabyte hard drive every four minutes. That's a mind-boggling amount of data, so the LHC computing grid was created to handle the information flow. The grid increases accessibility of LHC data. Imagine a pyramid, with CERN's computing center at the very tip. Once processed at the center, the data is suffused out to a wider base, universities across Europe and the UK. Each institution reprocesses and backs up the data before it is disseminated to an even larger base, about 150 universities and institutions around the world.